Welcome to this week's belated edition of our Tortie Shorties book reviews! 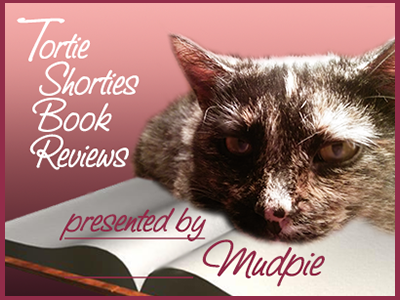 Tortie Shorties Review: This is a series I fell in love with thanks to the covers, only to find myself slightly underwhelmed after starting to read them out of order. This is now the fourth book in the series and I'm happy to say that I enjoyed it a great deal. Set in Krissy Hancock's cozy little bookstore cafe, Death By Coffee is a place any book and coffee lover would be happy to visit. Life takes an unexpected turn for Krissy when her father James, a famous mystery writer, shows up in town with his agent and agent's assistant in tow. Agent Rick has always had a bit of an unnatural fascination with Krissy, and when he makes unwanted advances towards her James is understandably livid. He promises to take care of the situation, which only makes him the lead suspect when Rick is found dead the next morning at the B&B he's staying at, covered in blood and his ever-present vanilla latte. While James is a mystery writer he's always wanted to help solve a real-life crime, so father and daughter team up to catch a killer. Turns out there's no shortage of suspects, including most of the members of the local writing group who wanted Rick to check out their work. I really enjoyed the addition of Krissy's father to this cast of characters and hope he visits Krissy again in the future. His scenes with busybody Rita (who is rather obsessed with him) are quite funny, and I also find myself liking Krissy's flamboyant neighbor Jules Phan more and more. I do wish the kitties in this series - shop cat Trouble (on the cover) and Krissy's orange cat Misfit - had a larger role in the story. The next book in the series is a Christmas-themed story (Death By Eggnog) so that makes it an automatic addition to my TBR pile! From the publisher: All is not what it seems…Mighty is stuck in an elegant waiting room which he calls a dungeon even though he gets plenty of fresh water and food. When Mighty’s parents pick him and his brother up, Mighty decides that he will find a place where cats are treated like kings. One day clumps of yellow goo start falling from the sky, and cats are attacked by small rodents. No one knows why the rodents are attacking cats. The two feline brothers see their dream destination on TV and want to have fun there. The attacks and mysterious yellow goop falling from the sky give the two feline brothers another incentive to flee to their dream land. On the way to Cat Land, Mighty and Brennon meet a cat who acts like a human. They fight a naughty cat, and also encounter black and white grazing animals which look like aliens to Mighty. They rescue a group of cats from an attack as well. Mighty finally captures a perpetrator and discovers that his secret is only fur deep. Mighty uses this secret to trick others into thinking that he and Brennon are dogs, for a good cause. Despites all the obstacles Mighty and Brennon overcome, nothing could have prepared them for what they experience in their dream land. The brothers’ parents get a phone call to pick their cats up, and the two felines receive the worst punishment that a cat can get for running away: a bath. Not all is dreary as Mighty and Brennon help put a stop to the attacks. They also have a shot at getting to another dream destination. Tortie Shorties Review: I'm about 30 years beyond the target age for this book but that didn't diminish my enjoyment of it one little bit. 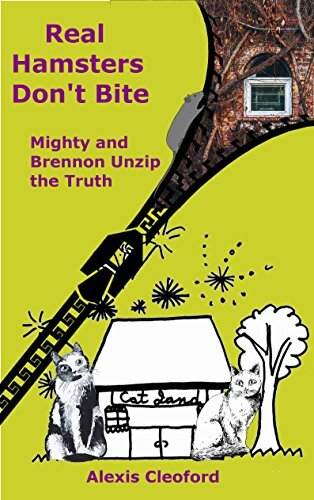 Children of all ages will find themselves smiling throughout this "tail" of two house cats who are eager for adventure and find it in spades on their journey to heaven on earth for felines, otherwise known as Cat Land. They learn more than one lesson along the way though including the fact that the grass isn't always greener on the other side of the street. The ending opens the door to Mighty and Brennon's new plan, and I can't wait to see what kinds of mischief the dynamic duo gets into next! Disclaimer: As members of the Amazon Associates affiliate program, if you click on our links and buy something Mudpie gets a little money for her piggy bank! I received review copies of both of these books in exchange for my fair and honest opinion. WE also like when the cat plays bigger roles too. I appreciate how your reviews are always honest. I fell in love with the cover art of Death by Vanilla Latte, and I'm so glad to hear that the story lives up to it. And Real Hamsters Don't Bite sounds like such a fun read! I have found myself enjoying some lovely children's reads in my adult years as well. Thank you for your always fantastic reviews, Mudpie and Melissa! I wish the cats had a bigger role in the Bookstore Cafe series too. What cat DOESN'T seek adventure? They excel at creating their own. The mystery sounds really interesting though I usually don't care for them - time for an exception! I am reviewing Real Hamsters tomorrow. 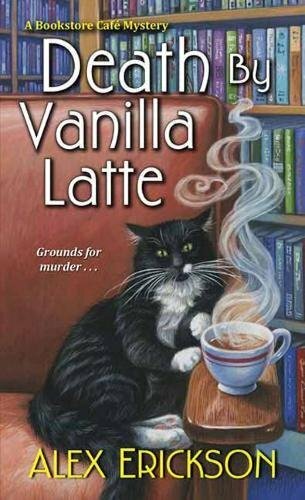 Death by Vanilla Latte would pull me in by the cover alone too. These books sound like a lot of fun. Death by Vanilla Late sounds like something that I would enjoy. I'm a big fan of thrillers and mysteries. :) You always do a pawsome job of reviewing stories, Mudpie! Mudpie, your review is a delightful tease for this latest Death By...have it wishlisted, and need to read the one in my TBR stack. This book and coffee store is too good to miss!! Recycle My CatLadyBox? I Think Not. We're Members of the Kitterati! It's Cutest Pet Contest Time! Catitions Privacy Screens Now On Indiegogo!